Mr. Kishor Gordhandas, of Mumbai, India, is one of the few Indian members of the International Playing Card Society, London. He is a collector of cards, and recognized for his largest collection of playing cards in the world with over 5000 packs in his position. His collection is featured in the Limca Book of Records every year from it's inception in 1990 through the present. In 1996 he was awarded a "Person of the Year Award" by the Limca Book of Records in recognition of his extensive card collection as well as his efforts in reviving the dying art of Indian Ganjifa card making. He is the proud owner of a vast collection of unique and the most uncommonly seen playing cards, with cards that come in all shapes (from oval to triangular), and sizes (upto one foot long). They depict anything from Puranic stories to Mughal rulers. The cards are carefully stashed away in a room in his house - a collection that he will always continue expanding. Mr. Gordhandas has written numerous articles about playing cards in English and Gujarati for magazines and periodicals in India and abroad. He has both designed and commissioned original decks of Ganjifa cards including eight suited Moghul and ten suited Dashavatara packs with both traditional and non-standard suit symbols. He has even designed and commissioned a unique hand painted "Hindu Astro Mythological Tarot" deck. He is also widely known for his interest in and his articles about Indian Trick Locks. This picture is of Great DALI TAROT of 78 cards , which is made by COMAS of Spain and is Gilt edged. It comes with a small booklet, and has 78 tarot pictures drawn by Salvador Dali with different of his signatures on each card. 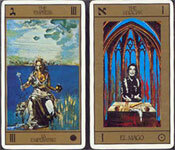 This Tarot is one of the most attractive Tarot packs of late 20th Century. 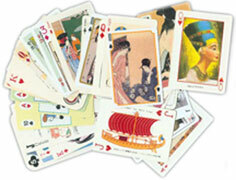 The assorted cards of Hiroshige, and Ukiyo-e from Japan , Pharaoh form Egypt , Antique ships form Japan and so on.